"Sampath Speaking" - the thoughts of an Insurer from Thiruvallikkeni: demonetisation ~ surge of Gold .......... and panic buying of salt !?!? demonetisation ~ surge of Gold .......... and panic buying of salt !?!? Common salt is a mineral composed primarily of sodium chloride (NaCl), a chemical compound belonging to the larger class of salts; salt in its natural form as a crystalline mineral is known as rock salt or halite. Salt is present in vast quantities in the seawater. Salt is essential for animal life, and saltiness is one of the basic human tastes. Salt is one of the oldest and most ubiquitous of food seasonings, and salting is an important method of food preservation. Yet, Gandhi's choice of the salt tax was met with incredulity by the Working Committee of the Congress, Jawaharlal Nehru and Dibyalochan Sahoo were ambivalent; Sardar Patel suggested a land revenue boycott instead. The Statesman, a prominent newspaper, wrote about the choice: "It is difficult not to laugh, and we imagine that will be the mood of most thinking Indians." The British establishment too was not disturbed by these plans of resistance against the salt tax. The Viceroy himself, Lord Irwin, did not take the threat of a salt protest seriously ! Gandhi was firm though. The salt tax was a deeply symbolic choice, since salt was used by nearly everyone in India, to replace the salt lost by sweating in India's tropical climate. The salt tax represented 8.2% of the British Raj tax revenue, and hurt the poorest Indians the most significantly. Britain’s Salt Acts prohibited Indians from collecting or selling salt, a staple in the Indian diet. Citizens were forced to buy the vital mineral from the British, who, in addition to exercising a monopoly over the manufacture and sale of salt, also exerted a heavy salt tax. Defying the Salt Acts, Mohandas Gandhi reasoned, would be an ingeniously simple way for many Indians to break a British law nonviolently. The Dandi March, also known as the Salt Satyagraha, began on 12th March 1930 and was a direct action campaign of tax resistance triggering the wider Civil Disobedience Movement. Down under in our own Tamilnadu, his close associate Sri C. Rajagopalachari, who would later become independent India's first Governor-General, organized the Vedaranyam salt march in parallel on the east coast. What lies on the road uncared for ~ would need high security perhaps !! Much water (perhaps money) has flown under the bridge since that great announcement by PM Shri Narendra Modi on currency demoentization. Some media has chosen to keep telling that common man is on the streets ~ the same media and the politicians who voice against never minded the dwelling of common on street on various issues, the blockades they made, when their motorcades passed by – but now shedding crocodile tears feeling fo the common man’s woes. One newspaper report suggests that soon after Prime Minister Narendra Modi announced the demonetization move, gold traders have stopped quoting any rates. The price is released by Mumbai Bullion Merchants' Association each day to be followed by markets throughout the country. There is no official rate and traders are having a free run. Shops are still open from the backdoor to those coming with wads of old currency for which the jewellers are quoting as much as 55,000 a tola (per 10 grams) states the press. On the face of it, traders say they are waiting for the dust to settle after which regular rates will be quoted. On that [8/11/2016] which Nation would ever remember - Gold prices shot up to 3-year high of Rs. 31,750 per ten gram, gaining a whopping Rs.900, following the government's scrapping high-denomination notes to curb black money and a firming trend overseas in view of Donald Trump's victory in US presidential election. It was gold's highest closing level of Rs. 31,820 after November 19, 2013 in the bullion market here. Away from the yellow metal, there has reportedly been shortage of common salt. It is reported that panic prevailed in various cities of Uttar Pradesh on Friday following rumours that there is an acute shortage of salt, which led to people purchasing salt at many times its original price. Taking note of the situation, Chief Minister Akhilesh Yadav affirmed that there is no shortage of salt in the state, and urged people not to engage in unnecessary purchase of salt. The chief minister also appealed to people not to pay heed to rumours. 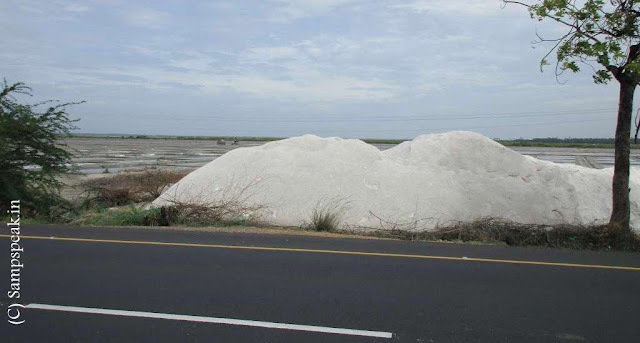 An article in New Indian Express reports that the rumours, which began almost immediately after the demonetisation, could not have been more ill-informed: the salt pans at Thoothukudi that spreads across thousands of acres have in fact produced more this season, building up a ready stock of a million tonnes in this coastal district alone. “Owing to surplus production, we have a stock of 8 lakh tonnes edible salt and 2 lakh tonnes of industrial salt,” Thoothukudi Collector M Ravi Kumar told Express. However, with panic purchase depleting stocks in many districts, the salt producers association has been asked to immediately supply it to other parts of the State, he added. Such was the yield this year that production crossed 20 lakh tonnes in 2015-16 “a one-third increase compared to the previous year’s 15 lakh tonnes,” said ARAS Dhanabalan, secretary of the Tuticorin Small Scale Salt Manufacturers Association, adding that exports have also dropped recently. So, what are you doin with the money, now not a legal tender ! !